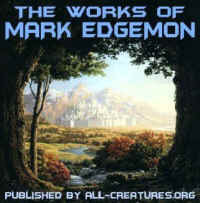 Mark Edgemon has been writing for 30 years. He writes and publishes short stories, articles, poetry and scripts, as well as, produces audio comedy productions for over 700 radio stations nationwide. Contact Mark through his website, Creator and the Catalyst. My name is Sam. I live a couple of blocks from my favorite Chinese restaurant, Asian Buffet. They have everything there, over two hundred items. You can't beat it for just $6.50 plus drink and tip. When they’re busy, I usually wait in the lobby, occasionally looking at their aquarium, filled with all types of colorful, exotic fishes. One afternoon, as I was looking in the tank, one in particular came up to the glass and stared at me. He stared at me for a long time. He was not colorful like the other fishes, but he looked soulful and sad. I was impressed that he spent so much time looking at me; until I too began too feel sad. I couldn’t explain it. My table was ready, so I said bye to the fish and went inside to have lunch. However, I couldn’t get him “the fish” out of my mind, or more over, my heart. I didn’t eat much, because my spirit was heavy, convicted maybe, I don’t know. But my thoughts were drawn to that fish. After I had finished lunch, I paid my bill and went back to the tank. He was glad to see me. Almost like a devoted dog. I had never had such a response before from a fish. I stayed with him a good long while, said goodbye again and went on about my day. What happened next is truly science fiction like, but it happened just the same. I started feeling him in my heart speaking to me. I didn’t understand it, but it grieved me. I felt he was asking me to come and get him. He was sad and depressed and he wanted me to rescue him. I tried to ignore the feeling, but it was ever with me. I stayed away from the restaurant for a couple of months, to avoid the burden that I didn’t want to be responsible for. After awhile, I went back and he was still there. I went to the tank and he came right to me. But instead of being happy, he was sad and disappointed in me. I knew he was disappointed in me and I was sorry. I asked him if he wanted me to take him home with me. He moved his mouth as if he was talking to me. I know that one could say that this is how all fishes act, but I felt this was different. I told him that I would take him home, and then went to have lunch. When I left, I told him I would be back for him. It was another month before I returned. This time when I went over to the tank, he ignored me as if he was mad at me and very, very disappointed. I started to talk with him and after awhile, he came over to see me. When I told him I would get him out of there, he turned around with his tail toward me. He wouldn’t turn around and face me. I was so grieved, that I had hurt and let him down; I determined to do something about it. I know other people would think me crazy, but who cares. I know what I know. I talked with the manager of Asian Buffet before sitting down to eat. He spoke very little English, but I pressed him and told him I wanted to buy that fish in the aquarium. On the way home I would buy the tank and the supplies, but until then, I would carry him home in a plastic bag filled with tank water. The manager went with me to the tank and I pointed the fish out. He nodded his head like he understood and told me he would take care of it. I asked him the price and he said $20.00. I agreed and then he escorted me to my seat for lunch. I got my salad and sat down. Half way through my meal the manager came over and set a plate down in front of me. When I looked down…I saw…it was the fish. He cooked the fish…my friend…was now laying on the plate…dead with his eye looking up at me! I was in shock. The grinning manager asked if everything was all right. It took me about thirty seconds to fully realize what had happened. He didn’t understand me. He thought I had ordered the fish. I had inadvertently killed the soul I was trying to help. I was sick. I was going to throw up. I put my hand over my mouth and ran to the bathroom. It was all I could do, to not throw up before I got there. I splashed cold water on my face. I couldn’t go back to the table. After awhile, I headed straight for the register to pay. The manager was concerned that something was wrong. I didn’t want to talk about it. I just wanted to get the hell out of there. I paid and I headed toward the door. I don’t know why, but I stopped by the tank as I was leaving. It looked empty. His soul was the only one I connected with inside the aquarium. I had never felt such grief. If I had saved him and not hesitated, he would be alive and happy at home with me. I will adjust, but I will never forget and maybe never lose the feeling of the loss. It was a hard lesson to learn, to act and not hold back when lead to do something compassionate. It is said and it is true, “He who hesitates…is lost!